Super pumped to be heading to the Lakota Nation in South Dakota this summer! @waniyetuwowapi @ironlak thanks for supporting!! Heartbroken. To those lucky enough to know him, we lost a special friend today and Philadelphia lost an underground king who held it strong for over 20 years. My heart goes out to all the guys who cared about him and stood by him over the years and the original Kensington OAL crew, @cesebone279 @the_magical_fruit and all the young heads he brought into the scene. I can’t believe I won’t get to see you again old friend. Rest easy Anthony, you were loved by many. There is a sense of satisfaction at midpoint through painting, when you like how it looks, but you know exactly what small details you can add to really give it life. Today, it started pouring rain just as I reached that point, so I appreciate that I can just enjoy where this wall is so far. This weekend has been full of positive feelings so far, I wish all of you the same for the holidays! 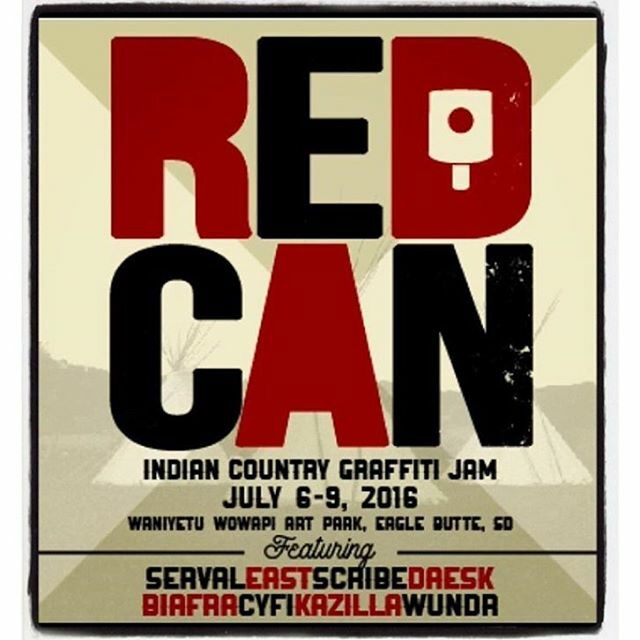 For the 1st time in a couple of years I’m missing out on the Red Can jam in The Cheyenne River Sioux Reservation, great lineup as usual in a very special place for me check the flicks on @waniyetuwowapi much love to @juliegarreau for organizing, my brother stylemaster @thealphachild , wonder twins @biafrainc and @wundr , bboy @cyfione , Chris and the Iron Lightning drum circle, @djmicah1 and the whole CRYP organization.